You could cut the tension with a skate. 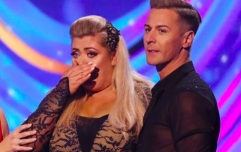 The other night, Gemma and Collins and Jason Gardiner had a bit of a scrap on Dancing On Ice. Following the TOWIE star's rendition of 'Diamonds Are A Girl's Best Friend', the judge said that Gemma was "more Anna Nicole Smith than Marilyn Monroe." He also called her a "brat." This came as Gemma accused Jason of "selling stories" about her to the press which came after Jason had called Gemma "lazy" in the tabloids during the week. It was a whole thing - and was actually rather uncomfortable to watch, tbh. Some other people clearly thought so too as they issued a load of complaints to Ofcom. Metro.co.uk reports that 50 people complained about Gemma's "outburst", with 33 more saying that Jason's comments were out of order. A spokesperson for the UK broadcasting authority said that they had to assess the complaints before deciding whether or not to investigate. Chances are they won't. Like, what would be the reason? It's grand like. This isn't the first time DOI has been swathed in scandal this year though. Last week, contestant Wes's girlfriend, Love Island's Megan, decided to go off on one at his skating partner, Vanessa Bauer. Megan accused Vanessa of strategically announcing her breakup just before she began skating with Wes for the sake of a few headlines. She also claimed that Vanessa had never invited Megan to come watch her skate with Wes - even though this arguably is not her job at all. It's all going on, lads.